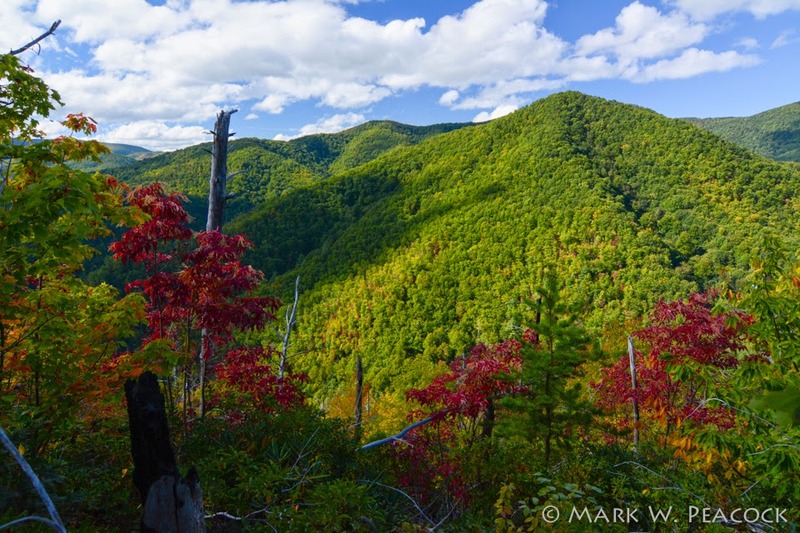 The views from White House Rock Cliffs are phenomenal - especially this time of year when the leaves are beginning to change. But the hike to get there is grueling. The trail is being established (or perhaps, reestablished) and is not well marked or obvious in places. And while the first two-thirds of the hike is relatively easy, the last 1/3 is a calf-burner, straight up a mountain side. I recommend going on a cool day and that you take some water along. And because the trail isn't always immediately clear, study the map below to get a sense of its general trajectory as it circles around the mountain. If you've been on I-26 heading from NC to TN, you may have seen the rugged cliffs off to the west within Rocky Fork, north of Flag Pond, TN, this is known as White House Cliffs. The links below will show you this view. It's not an especially long hike, just under 1.5 miles each way. But it's one of the harder hikes I've experienced in this area in terms of vertical climb in a short distance. Nothing is hand-over-hand, just a very steep trail. So be prepared for that! 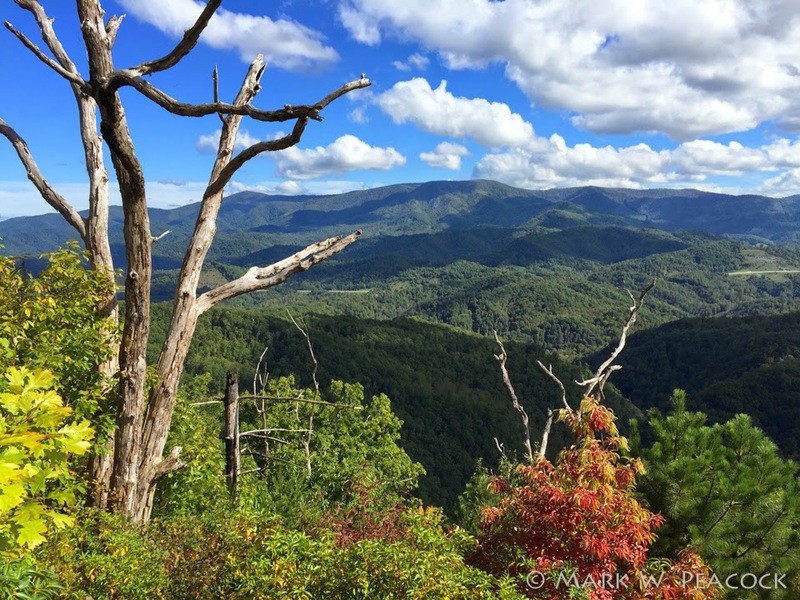 Once on top, you can explore and climb down the from the steep, rocky pinnacle to the actual rock outcropping that is visible from the interstate. But from what I've read (again, see links below) this is very difficult and also dangerous to do. But as the dog (and I) were worn out and in need of water, I took some shots from the summit and headed back down the mountain. 1. 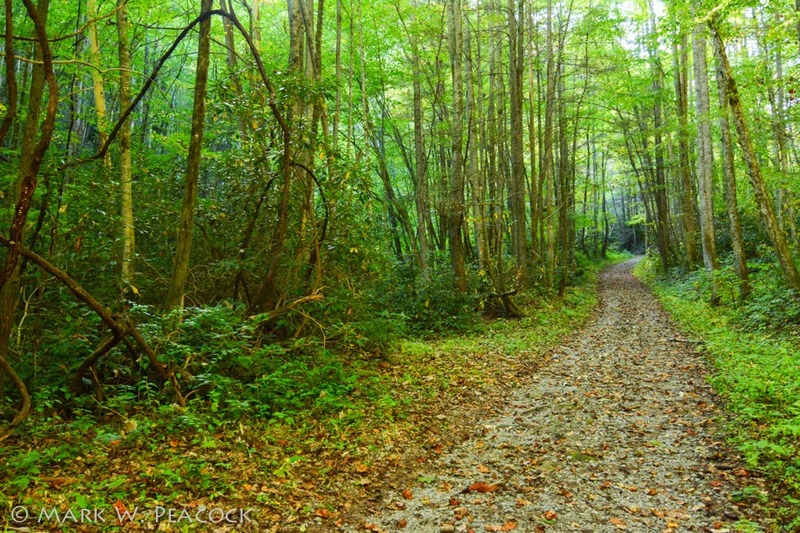 You'll follow the main road (photo left) into Rocky Fork for about 1/2 mile, past the Triple Falls and up and around the bend until you are almost to where the road forks. On your right you'll see a wooden stake with an orange flag tied to it (photo below left). This is the trail head to White House Cliffs Trail. 2. This next segment follows a small creek bed, with the trail sometimes running along the stream, other times actually in the stream. So old shoes are helpful. In dryer months, this stream doesn't run. 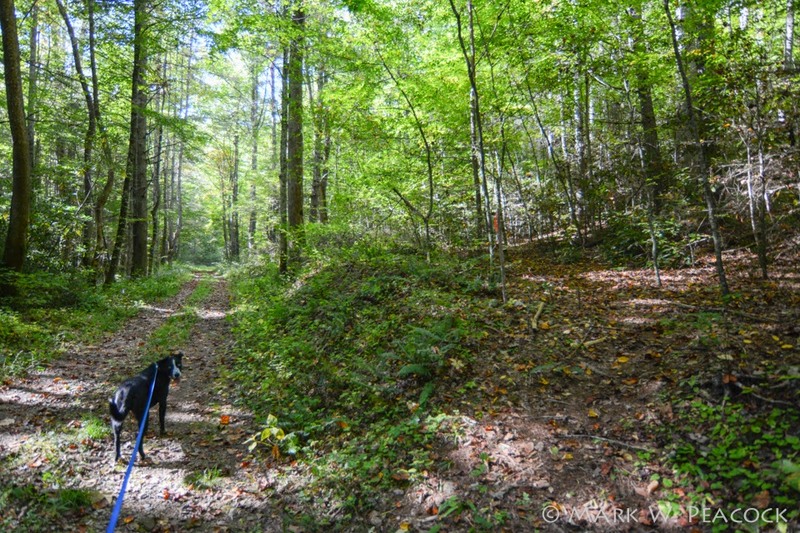 After a time it becomes clear this trail is actually part of an old logging road. It's fairly easy to follow the trail at this point and the elevation gain is gradual. Eventually, you'll reach a high point (saddle, gap) where the continuing logging road starts to descend. At this saddle, look to your right and you'll see the trail continues. 3. This is where it gets steep. And the trail isn't always so clear. Occasionally you'll find a helpful orange or pink flag, but these are few and far between. Watch your footing and pay attention to where you're going. It's easy to get turned around. 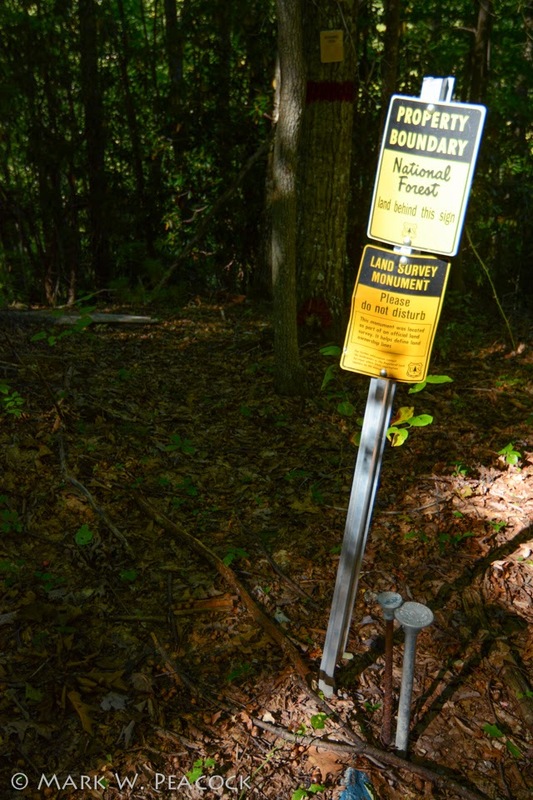 You will soon arrive at a very obvious survey marker (photo below), and the trail makes another sharp right hand turn. Pay attention to where you just came from, this is the only point at which I had a hard time figuring out where to go when coming back down the mountain. The trail now become (gasp) even steeper as it follows the ridge up to the top. Keep at it and your efforts will be rewarded with amazing panoramic views. There are times near the top where the trail is a little unclear, but again, take your time and look things over. This will be helpful when coming back down! For a terrific map of the White House Cliffs Trail, click here. 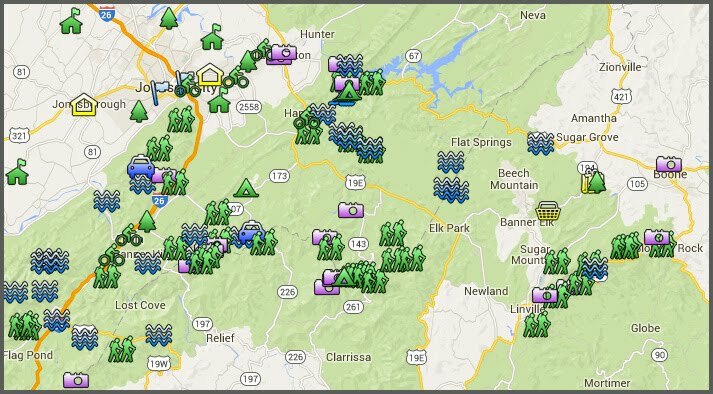 For a helpful map giving an overview of the trails of Rocky Fork, click here. 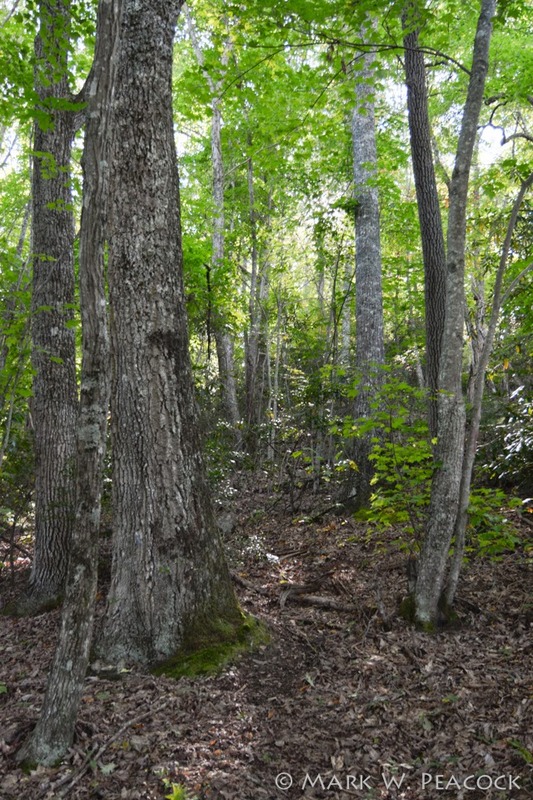 Update (Spring 2015): The trail has seen more use and is much easier to find and navigate. 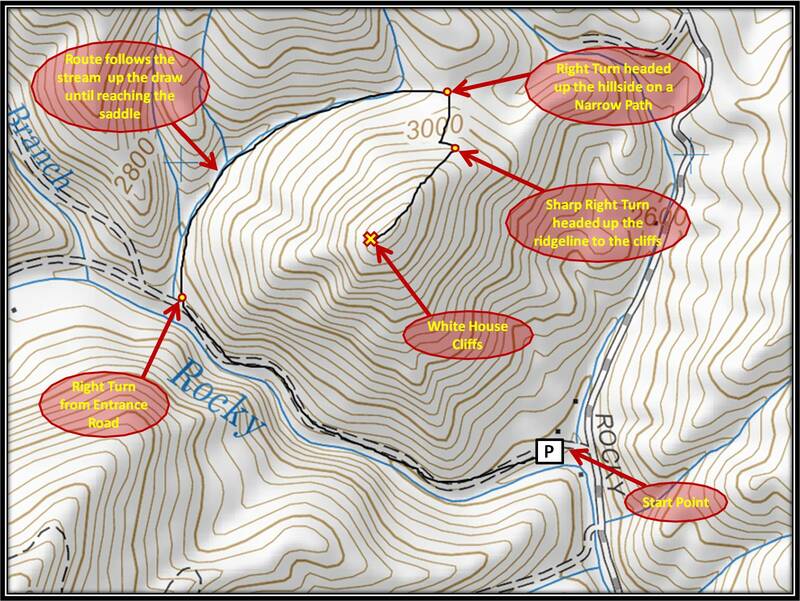 The best thing you can do is follow study this WH Cliffs Trail map to get your bearings. Wear old shoes for the second section that follows the creek! Very muddy after a rain. We climbed down a bit farther from the top, but it's rough. Rocky, thorny, steep, unsteady. Turned around after a bit. When we got on the interstate headed back home we looked over at the cliffs, and were amazed how far down they are from the top. Glad we didn't continue down to them. From what I've read, it's crazy dangerous to try to head down to the road from the cliffs (which makes sense), so you would have to ascend the peak once again and come back whence you came. :) For me, I'm more than content with the amazing views from the top.